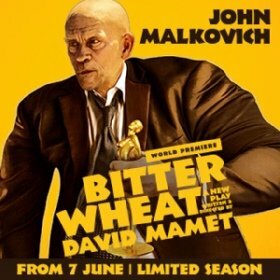 The multi award-winning John Malkovich returns to the West End stage after nearly 30 years to play Barney Fein, a top dog Hollywood producer in Bitter Wheat, a new play by the legendary author, director and playwright David Mamet. It will preview at the Garrick Theatre on Friday 7 June 2019 with a press night on Wednesday 19 June 2019 and will be directed by Mamet. Doon Mackichan, who is well known for her extensive TV work which includes creating and starring in the hit comedy series Smack the Pony for Channel 4, Knowing Me, Knowing You with Alan Partridge, Plebs for ITV2 and Two Doors Down for the BBC, will play Barney Fein’s assistant, Sondra. Ioanna Kimbook will make her debut theatre performance in Bitter Wheat as Yung Kim Li. Further casting is to be announced. A new play starring John Malkovich, written and directed by David Mamet in a good mood. Funnier than The Iceman Cometh, more chaos than Richard III, and without all the stupid, so-called ‘poetry’. Bitter Wheat is produced by Jeffrey Richards and Smith & Brant Theatricals.